Dr. Smith is a graduate of the University of Michigan where he received the chancellor’s scholarship during his undergraduate years. He attended medical school at the College of Osteopathic Medicine of the Pacific in Southern California. His internship training was at Botsford General Hospital in Farmington Hills, Michigan which was followed by residency training in Physical Medicine and Rehabilitation at the University of Minnesota. 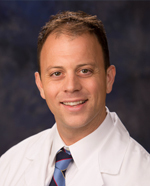 Dr. Smith completed his fellowship in central California at LAGS Spine and Sportscare. He has been involved in research projects and presentations on spinal injections, musculoskeletal ultrasound, spasticity management, and pain management. Dr. Smith was raised in Michigan and is very proud of his Midwestern roots. He grew up as an avid outdoorsman and athlete and enjoys backpacking, mountain biking, fishing, weight training, running, snowboarding and skiing. “The desert region is very inviting because of the opportunity for my family to participate in the activities we enjoy,” says Dr. Smith. Dr. Smith is an active member of the American Academy of Physical Medicine and Rehabilitation, the American Academy of Pain Medicine, the American Association of Neuromuscular and Electrodiagnostic Medicine, the International Spine Intervention Society, the Association of Academic Physiatrists, and the American Osteopathic Association.